The library, part of the original campus laid out by Philip Randolph, now known as "East Quad"
In 1932, the architect Randolph Evans drafted a plan for the college's campus on a substantial plot of land his employer owned in the Midwood section of Brooklyn. He sketched out a Georgian-style campus facing a central quadrangle, and anchored by a library building with a tall tower. Evans presented the sketches to the President of the college at the time, Dr. William A. Boylan. Boylan was pleased with the plans, and the lot of land was purchased for $1.6 million ($23,900,000 in current dollar terms). Construction of the new campus began in 1935, with a groundbreaking ceremony attended by Mayor Fiorello La Guardia and Brooklyn Borough President Raymond Ingersoll. In 1936, the President of the United States Franklin D. Roosevelt went to Brooklyn College to lay the cornerstone of the Brooklyn College Gymnasium. 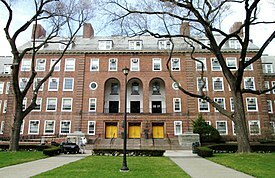 President Boylan, Borough President Ingersoll, and President Roosevelt all had buildings on Brooklyn College's campus named after them. Harry Gideonse was the second President of Brooklyn College, from 1939 to 1966. During his tenure Brooklyn College was one of the top colleges in the US in terms of the number of alumni receiving doctorate degrees. In May 1983, Brooklyn College named its library the Harry D. Gideonse Library. John Kneller was the fifth President of Brooklyn College, from 1969 to 1979. Students occupied his office at the college during a student strike after the Kent State shootings and the Cambodian Campaign in 1970. He terminated classes, but kept campus buildings open for students and faculty. A member of the Brooklyn College Fencing Team introduced streaking to the college in 1974, dashing across the Quad. The campus located in Midwood became the only Brooklyn College campus after the school's Downtown Brooklyn campus was shut down during the 1975 budget emergency. Brooklyn College's campus East Quad looks much like it did when it was originally constructed. The campus also serves as home to BCBC/ Brooklyn College Presents complex and its four theaters, including the George Gershwin. The demolition of Gershwin Hall, replaced by The Leonard & Claire Tow Center for the Performing Arts, is the most recent construction on an evolving campus. Other changes to the original design include the demolition of Plaza Building, due to its inefficient use of space, poor ventilation, and significant maintenance costs. 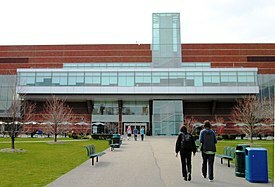 To replace the Plaza Building, the college constructed West Quad Center, designed by the notable Uruguayan architect Rafael Viñoly. The new building contains classroom space, offices, gymnasiums and a swimming pool. 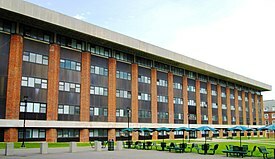 It houses the offices of Registration, Admissions, Financial Aid, and the Department of Physical Education and Exercise Science. The grounds contain a quadrangle with grassy areas and trees. New façades are being constructed on Roosevelt and James halls where they once connected with Plaza Building. The 2009–10 CUNYAC championship men's basketball team now plays its home games in the West Quad Center. This follows a major library renovation that saw the library moved to a temporary home while construction took place. The Brooklyn College library is now located in its original location in a completely renovated and expanded LaGuardia Hall. Noted as one of the most beautiful in the United States, In 2016, Brooklyn College announced a new home for the Koppelman School of Business, with the construction of a new building, Koppelman Hall, on property adjacent to the 26-acre campus bought in 2011. This increased the campus size to 35 acres. The campus has been shown on numerous movies and television shows. Beginning in 1981, the college instituted a group of classes that all undergraduates were required to take, called "Core Studies". The classes were: Classical Origins of Western Culture, Introduction to Art, Introduction to Music, People, Power, and Politics, The Shaping of the Modern World, Introduction to Mathematical Reasoning and Computer Programming, Landmarks of Literature, Chemistry, Physics, Biology, Geology, Studies in African, Asian, and Latin American Cultures, and Knowledge, Existence and Values. In 2006, the Core Curriculum was revamped, and the 13 required courses were replaced with 15 courses in 3 disciplines, from which students were required to take 11. In the fall of 2013, Brooklyn College embarked on CUNY's new general education alternative, the Pathways curriculum, consisting of three components: Required Core (four courses), Flexible Core (six courses) and College Option (four courses)—totaling 42 credits. Brooklyn College offers over a hundred majors varying from the visual arts to Women's Studies. The Division of Graduate Studies at Brooklyn College was established in 1935 and offers more than seventy programs in the arts, education, humanities, sciences, and computer and social sciences. Among those programs is the Graduate theatre program, which is the top ranked in the CUNY system and 14th in the United States; faculty include Tony Award nominee Justin Townsend. The Brooklyn College B.A.–M.D. program is an 8-year program affiliated with SUNY Downstate Medical Center. The Program follows a rigorous selection process, with a maximum of 15 students selected every year. Each student selected to the program receives a Brooklyn College Presidential Scholarship. B.A.–M.D. students must engage in community service for three years, beginning in their lower sophomore semester. During one summer of their undergraduate studies, students are required to volunteer in a clinical setting where they are involved in direct patient care. B.A.–M.D. students are encouraged to major in the humanities or social sciences. A student who majors in a science must choose a minor in the humanities or social sciences. All students meet the pre-med science requirements by taking cell and molecular biology, botany, physiology, general chemistry, organic chemistry, and general physics. B.A.–M.D. students must maintain at Brooklyn College an overall grade point average of 3.5, and a pre-med science GPA of 3.5. The Coordinated Honors Engineering Program offers a course of study equivalent to the first two years at any engineering school. Students who maintain the required academic level are guaranteed transfer to one of the three coordinating schools—NYU-Poly, City College of New York School of Engineering, and the College of Staten Island Engineering Science Program—to complete their bachelor's degree in engineering. Coordinating Engineering students have also transferred to SUNY Stony Brook, University of Wisconsin, University of Michigan, Cooper Union, and the Massachusetts Institute of Technology. Students admitted as incoming First-Year receive a Brooklyn College Foundation Presidential Scholarship that provides full tuition for their two years of full-time undergraduate study in the Coordinated Engineering Program. As members of the Honors Academy, Engineering Honors students take advantage of individual advising, faculty consultation, and early registration. In the Commons they find study facilities, computer access, academic, scholarship, internship, and career opportunities, and, above all, intellectual stimulation among other talented students like themselves. Students applying to the Engineering Honors Program will also be considered for the Scholars Program. Barry R. Feirstein Graduate School of Cinema is the first public graduate film school in New York City. It is the only film school in America to have its own classroom on a film lot with the collaboration of Steiner Studios, the largest soundstage on the East Coast. The program offers a two year M.A. in Cinema Studies, a two year M.F.A. in Cinema Arts in the discipline of Producing, and a three year M.F.A in Cinema Arts with five disciplines of Cinematography, Directing, Post-production, Screenwriting, and Digital Arts and Visual Effects. The school opened in the fall of 2015. The first graduating class was in Spring 2018. Brooklyn College teams participate as a member of the National Collegiate Athletic Association's Division III. The Bulldogs are a member of the City University of New York Athletic Conference (CUNYAC). Men's sports include basketball, cheerleading, cross country, soccer, swimming & diving, tennis and volleyball. Women's sports include basketball, cheerleading, cross country, soccer, softball, swimming & diving, tennis and volleyball. In 2010 Brooklyn College adopted the Bulldog as its new mascot. The athletic program was originally known as the Kingsmen. In 1994 the mascot was changed to the Bridges. However, after building new facilities and undergoing other changes the athletic director pushed for a new name to reflect the new program. 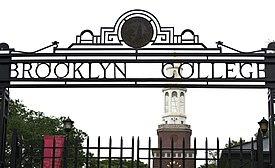 Notable alumni of Brooklyn College include Senator Bernie Sanders (1959-1960), Senator Barbara Boxer (B.A. 1962), Congresswoman Shirley Chisholm (B.A., 1946), composer Laurie Spiegel (M.A., 1975), Pulitzer Prize-winning author Frank McCourt (M.A., 1967), Fifa U-17 world cup champion Joseph Babatunde (B.A 2000), Harvard Law School professor and author Alan M. Dershowitz, Securities and Exchange Commission Chairman Harvey Pitt, Emmy Award-winning actor Jimmy Smits (B.A., 1980), Sopranos stars Steve Schirripa (B.A., 1980) and Dominic Chianese (B.A., 1961), New York Mets President Saul Katz (B.A., 1960), and Academy Award-nominated filmmaker Paul Mazursky (B.A., 1952). Seymour L. Hess – meteorologist and planetary scientist. Ethyle R. Wolfe -- Professor from 1947 to 1989, created the Ethyle R. Wolfe Humanities Institute at the college. ^ a b c d e f "Fast Facts". Brooklyn College. City University of New York. 2018. Retrieved February 16, 2018. ^ "Brand Guidelines" (PDF). Brooklyn College. City University of New York. 2018. Retrieved February 16, 2018. ^ "College Rankings". U.S. News & World Report. Retrieved 1 May 2016. ^ Freudenheim, Ellen & Wiener, Anna (April 2004). Brooklyn: The Ultimate Guide to New York's Most Happening Borough. ISBN 9780312323318. Retrieved October 14, 2011. 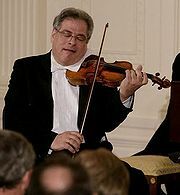 ^ Valenti, John (August 7, 1986). "Brooklyn College Basketball Problems". Newsday. Retrieved October 14, 2011. ^ a b c Service, N. Y. Times News. "HARRY D. GIDEONSE, 83; HEADED BROOKLYN COLLEGE". chicagotribune.com. ^ "Biographical note", New School for Social Research Libraries & Archives. ^ Waggoner, Walter H. (March 14, 1985). "Dr. Harry D. Gideonse Dead; Ex-Head of Brooklyn College" – via NYTimes.com. ^ "MINUTES OF THE MEETING OF THE BOARD OF HIGHER EDUCATION OF THE CITY OF NEW YORK HELD JANUARY 29, 1979"
^ a b c d "Dr. Kneller, Former Brooklyn College President, Dies at 82". Brooklyn Daily Eagle. ^ Lubasch, Arnold H. (March 20, 1970). "Kneller Inducted as Head of Brooklyn College" – via NYTimes.com. ^ College & University Business. McGraw-Hill. 1969 – via Google Books. ^ BROOKLYN, KENT STATE, MAY 1970: Diary of an 18-Year-Old College Freshman. Richard Grayson – via Google Books. ^ a b c Heise, Kenan. "EDUCATOR ROBERT HESS; GUIDED BROOKLYN COLLEGE". Chicago Tribune. ^ a b Ohles, Frederik; Ohles, Shirley G.; Ohles, Shirley M.; Ramsay, John G. (1997). Biographical Dictionary of Modern American Educators. Greenwood Publishing Group – via Google Books. ^ Davis, Tina; Resnick-Ault, Jessica (2015). Hess: The Last Oil Baron. John Wiley & Sons – via Google Books. ^ Calder, Rich (May 14, 2011). "New performing arts center for Brooklyn College". New York Post. Retrieved September 5, 2016. ^ "Campus #1 in Beauty". Brooklyn College. August 20, 2002. Retrieved July 21, 2011. ^ "Brooklyn College building new school of business". November 22, 2016. ^ "CUNY--Brooklyn College - U.S. News Best Grad School Rankings". U.S. News & World Report. Retrieved 20 February 2018. ^ "Old Core Curriculum". Brooklyn College. Retrieved July 21, 2011. ^ "New Core Curriculum". Brooklyn College. February 6, 2009. Retrieved July 21, 2011. 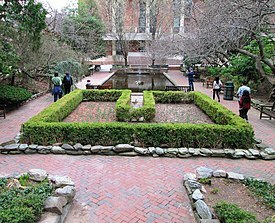 ^ "Brooklyn College - Pathways". Brooklyn College. Retrieved 21 March 2015. ^ "General Information". B.A.-M.D. Program. Brooklyn College. 2018. Retrieved February 19, 2018. ^ "Scholars Program". Brooklyn College. Retrieved 21 March 2015. ^ "Robert Beauchamp, American (1923–1995)". Ro Gallery. 2011. Retrieved Jun 30, 2011. ^ "Hans L. Trefousse (1921–2010)". Historians.org. Retrieved 21 March 2015. ^ Clayman, Dee L. (2010-09-11). "Ethyle R. Wolfe (1919–2010)". Classical World. 103 (4): 542–543. doi:10.1353/clw.2010.0004. ISSN 1558-9234 – via Project MUSE. (Subscription required (help)). 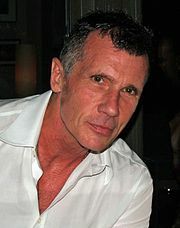 ^ Copage, Eric V. (17 October 1982). "Journalism Award for Media Founder". Daily News. Retrieved 2018-12-29 – via Newspapers.com. ^ "Theresa Wolfson". Jewish Women's Archive. Retrieved May 13, 2011. ^ "Wolfson, Theresa". Jewish Virtual Library. Retrieved May 14, 2011.